Today, I doodled outside…and used my iphone to capture it all. Overall it took about 2-3 hours, but at least half an hour was waiting for the iMovie app to install on my phone. I hope to get better making videos of my doodling adventures, but if not…at least you can check this one out. Thanks! 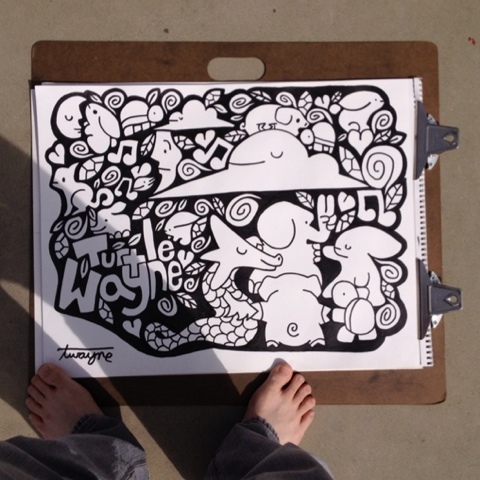 Today, I want to share with you 10 fun, crazy, and uncommon things I have drawn on. I have doodled on many different things due to requests, challenges, commissions, and boredom. Here are ten of them today, and I hope to share another ten in the future. I took a Micron pen size 005 to two of the best looking grains of rice I could find, and my life has never been the same. My dad just had poured concrete in our backyard one day, and at night it was perfect to take a chopstick to for a doodle. The bits of concrete that surface as you dig into it is annoying. Great thing we had an air compressor to blast that all away as I carved into the concrete. The glossy page of a magazine is perfect for my favorite decocolor paint markers. I found a lot of great pages with plenty of white space, but this one of Audrey Hepburn really “jumped” at me. On a trip to the thrift store with my girlfriend, we stumbled upon this little treasure. It didn’t cost much so I bought it and took a decocolor paint marker to it. I ended up selling this piece to a great fan of my artwork in Canada. I really like tattoos, but not the fact that they are permanent. So I love to use body art paint to give myself temporary tattoos that last about a week. I use Tribal Body Art Ink, and a very small and thin brush. My dad told me to draw on an egg. So I did. I used a sharpie to doodle on this lighter someone left in my studio. I don’t remember what compelled me to take a micron pen to a peanut…maybe I am “nuts”. People have asked me if I’ve ever worn these shoes that I doodled on with sharpie before. I haven’t because the shoes aren’t in my size. I found them in the clearance bin at a sporting goods store, and couldn’t resist not getting them just to draw on. I’ve gone “bananas”! I was inspired to draw on a banana when I saw another artist draw on bananas. I used black, red, green, and blue decocolor paint markers for this fruit doodle. What fun, crazy, or uncommon thing would you suggest to draw on? Step 1. Draw on lobby fire escape door for 10 hours. Step 2. Watch it show up on tv for 1 sec. 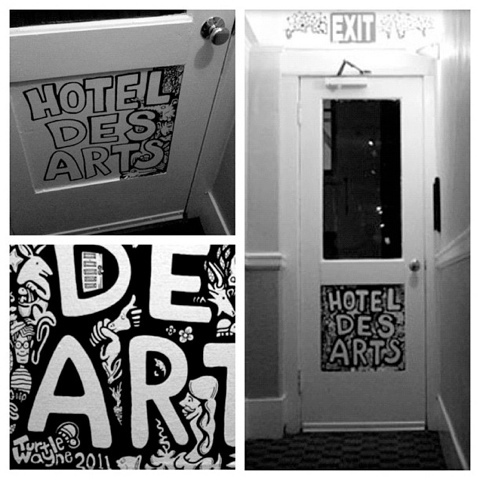 Thanks to &THEM for getting me into the Hotel Des Arts…thanks to GOOP for asking me to draw on the space with him…thanks to Hotel Des Arts for the opportunity to be a part of their building…and thanks to the cameraman for filming my artwork! 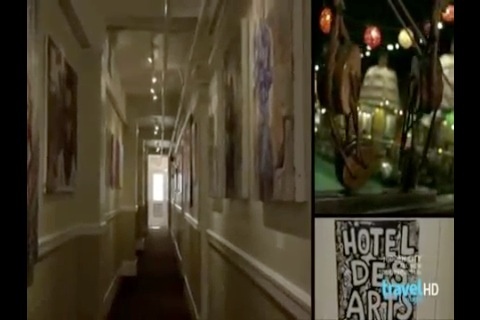 When I got to Hotel Des Arts, issa was doing an artpiece in chalk to promote the show. She handed me what was left of the green chalk stick, and I drew a turtle. Thanks issa…I will forever cherish watching random people walk all over your art and my turtle. I met the dj first and took a shot of their perspective from their table. Mos Def’s stunt double was there…nice. My stuff is on the lobby floor…down the hall towards the back. Here let me show you. Turtle Hello Kitty got me the most compliments. Also I met some new nice people that really dug my art and wanted me to sketch something for them on the spot. Got 10 of my limited edition hand vinyl transferred Turtle Tees up for display too. SWAG! This is what I got from the show…artist cards to add to my growing collection. I wanted to show my gratitude and thanks to everyone that went to the opening so I passed out about 40 turtle pins that are the same colorways as the turtles that are currently hanging there.